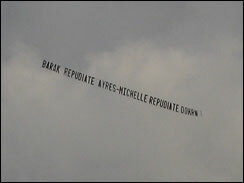 Banner Calls On "Barak" Obama To Repudiate "Ayres"
(MIAMI) As Michelle and Barack Obama took the stage at Bicentennial Park tonight, a plane flew over the event with a banner that read, "Barak Repudiate Ayres, Michelle Repudiate Dorhn." As you may have noticed, Obama's first name is spelled wrong on the banner, as is Ayers' last name. Obama has spent a good portion of his speech denouncing political attacks and the negative tone of the campaign. "One thing we know is that change never comes without a fight," he said. "In the final days of campaigns, the say-anything, do-anything politics too often takes over. We've seen it before. And we're seeing it again today. The ugly phone calls. The misleading mail and TV ads. The careless, outrageous comments. All aimed at keeping us from working together, all aimed at stopping change."